The credentials used to sign into dbFront are determined by the dbFrontService. To change this see the topic Authentication. If you have setup Database Authentication then you may see the "Directory" field. This field allows the user to select which area they would like to login to. The dbFront Login screen has the ability to show an HTML formatted Notice at the top of the login screen. The HTML must be properly escaped. 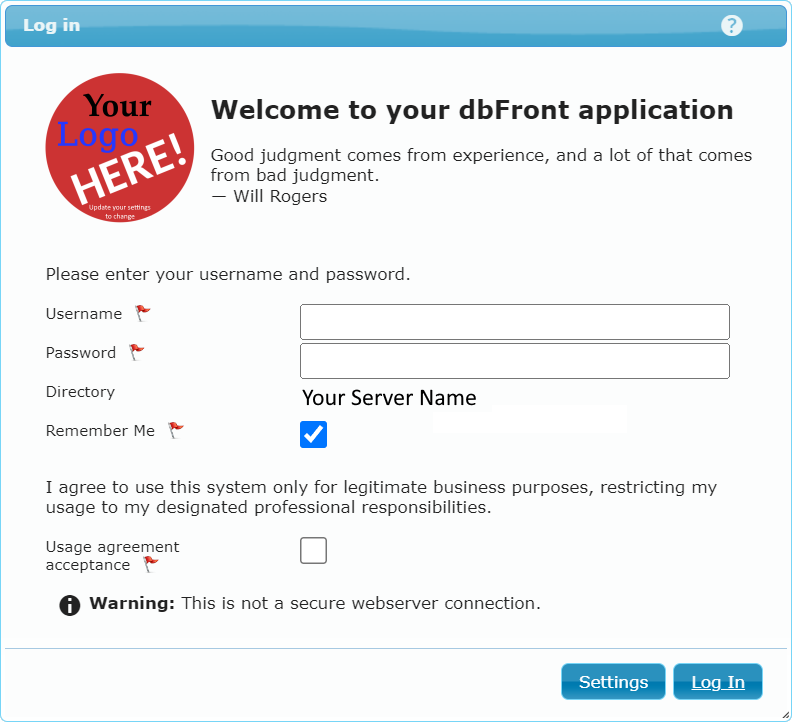 The dbFront Login screen has the ability to show a user agreement. This can be setup by adding or uncommenting the key "UsageAgreement" in the dbFrontUI web.config file. The text of the usage agreement is determined by the value. If a usage agreement is specified then dbFront will require that the user the check the usage agreement before they can sign in. One feature that may seem annoying is that the Login Screen will specifically warn users if they are logging in on a connection that is not secure. To remove this warning the administrator will need to install a SSL Certificate on the webserver used to host dbFront.